What is DA Form 3020-R? DA Form 3020-R or the Magazine Data Card (MDC) is a document prepared by the ammunition storage unit to record all the information regarding each lot of the munitions issued, received, stored or held in stock except for the cases when the received ammunition should be directed to a stack that already exists. The MDC - often incorrectly referred to as DD form 3020-R - is not a controlled document that needs to be registered and may be reprinted by the authorized personnel if required. The letter R following the form number stands for "reproducible", meaning that the form may be reproduced in the amounts necessary to cover the demand for it. The form was last revised in August 1989 and is still relevant and in use today. A fillable DA Form 3020-R is available for download below. 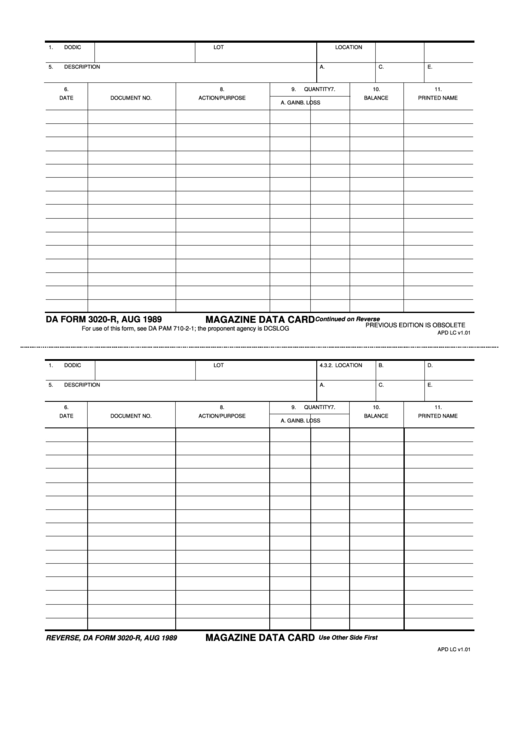 How To Fill Out a Magazine Data Card? The Magazine Data Card is usually filled out by the checker who deals with the shipments and is responsible for handling the ammo in the ammunition storage unit. DA Form 3020-R is time-sensitive: the time provided for filling out the card is 20 minutes. The MDC is digitally filled in or carefully handprinted and then attached to every lot of ammunition in the storage area. The information included in all parts of the form should be accurate, legible and must provide relevant data about the ammunition. This includes the Department of Defense identification codes, lot numbers, the location, description, quantity, and purpose of the items stored. This data must comply with other documents accompanying the listed ammunition. The document identification numbers should be inserted into the corresponding graph of the Magazine Data Card as well. The accuracy of the DA 3020-R record is checked by the person who is in charge of the form. DD Form 1384, Transportation Movement Control Document is the document used for scheduling the transportation and storing any relevant information regarding the shipments.